Conventional Gap and Overlap Type Wave Springs are used in a wide variety of applications. For short deflections and low-medium forces, they function with precision and dependability. 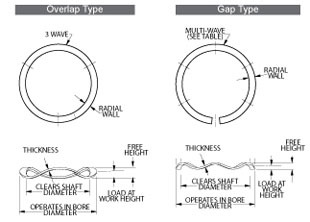 These two types of Smalley Wave Springs permit radial expansion or growth in diameter within a cavity, without the binding or hang-up normally associated with die stamped wave washers. Just as their terms imply, the gap type is split to retain a gap between the ends; while the overlap type has overlapping ends. Thus, the ends are free to move circumferentially as the spring outside diameter grows during compression. For example, the O.D. of a Gap Type Wave Spring would fit .020 loose per side in a bore. Its I.D. clears a shaft by .010 per side. As the spring is deflected, the O.D. and I.D. grow larger until the O.D. contacts the bore. Continued deflection causes the gap ends to move closer together while the O.D. presses against the bore. An Overlap Type Wave Spring permits this type of cycling action in a similar manner. Smalley narrow section wave springs were originally designed to pre-load packings in telescoping hydraulic cylinders. They have also found other applications where working space is highly limited. 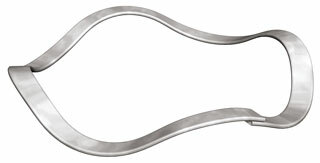 This Smalley Wave Spring series is designed to fit into a bore with a light snap to assure perfect concentricity between the wave spring and assembly. When these narrow section wave springs are compressed, radial expansion is taken up by the gap in the spring to eliminate binding. 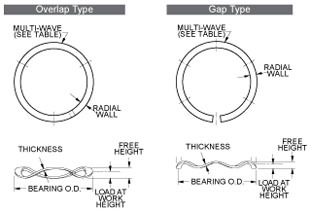 Gap and Overlap type Wave Springs designed to match popular metric bearing sizes. Available in both carbon and stainless steel from 16 mm to 600 mm diameters. Smalley Circular-Grain® bearing preload Wave Springs eliminate play and minimize bearing noise. The constant light/medium pressure they apply removes play between the ball bearings and the bearings’ inner and outer races. 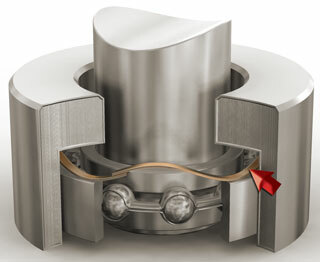 Preloading can reduce the possibility of bearing damage due to vibration (vibratory loading) and wear due to repetitive and non-repetitive runout.